Dr. Emily Dossett met a patient once who had schizophrenia, but went off her medication when she got pregnant. The pregnant patient then ended up in the hospital several times for psychotic episodes, and eventually landed in jail for assaulting a fellow patient. 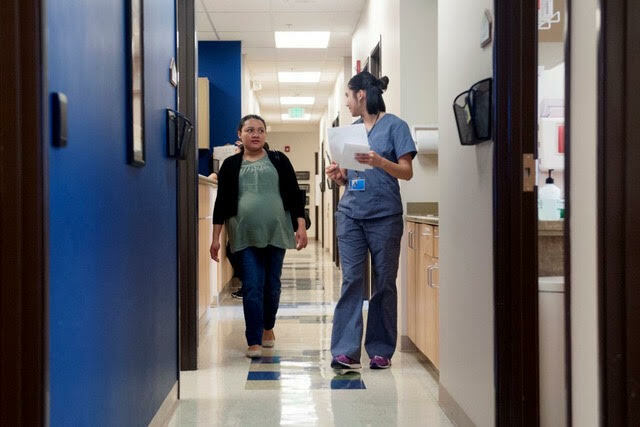 Dossett, a psychiatrist who works with women struggling with mental and emotional issues connected to pregnancy and postpartum, met her once she was in jail. The woman gave birth while incarcerated, and the Department of Child and Family Services took the baby because there was no family member to take custody. Dossett thinks the woman’s situation could have been a lot less traumatic had she gotten specialist psychiatric care a lot sooner. She says this woman’s story is all too common. Dossett, an assistant professor in both the Psychiatry and Behavioral Sciences and OB-GYN departments at USC’s Keck School of Medicine, believes that connecting doctors — general physicians, OB-GYNs, pediatricians and general psychiatrists — to specialists who can treat pregnant women for behavioral health issues could help women who would otherwise fall through the cracks. She is spearheading a pilot program in Los Angeles County to do just that. Email-based programs have already proven successful for getting other safety net patients specialty advice, treatment and referrals. In 2012, the Los Angeles County Department of Health Services (DHS) implemented the souped-up email system eConsult to connect primary care providers with specialists. Dossett is adding maternal mental health to the existing mix of specialties. In California, low-income mothers are much more likely to experience prenatal depression than women with private insurance. Untreated behavioral issues can be damaging to both the mother and the child’s long-term physical and mental health. Together with collaborator Christopher Benitez, a psychiatrist with the Department of Health Services, Dossett launched the pilot for Los Angeles County’s Department of Mental Health Services this past summer. I recently sat down with Dossett to learn more about how her project might help get women the behavioral health care they need. A: The missing piece for a lot of people in this field is what’s called “reproductive psychiatry” — psychiatrists who are trained to feel comfortable working with pregnant and postpartum women. And a lot of it is women themselves who go off their meds. So it’s not like women are dying to stay on their meds, and doctors are thwarting them. A lot of women just go off because they hear that they’re bad for the baby. I was really frustrated of seeing women get pregnant and then not have adequate care. I felt like my clinic was putting women back together who had dropped out of the system because they got pregnant. Q: What are some of the issues for the fetus or child if the mother suffers from a perinatal mood disorder? A: What we know from the literature is that relapse is very real and untreated anxiety and depression is really bad for the mother and the fetus. It actually has repercussions for the life of the child. These are hard to separate out: being exposed to depression and anxiety in the womb, and then the issues around being raised by a parent who is struggling with anxiety and depression. So it’s a little bit nature and nurture, and it’s kind of a mashup. There’s this idea of epigenetics. You have your genome that you get in your DNA and how that’s actually expressed is heavily influenced by what’s called the “intrauterine milieu” — what's going on in the womb. And so if the mother, say, is struggling with untreated anxiety or depression, her own stress management and stress hormones are off kilter. Cortisol is one that has been studied a lot. Of course, Serotonin and norepinephrine and other neurotransmitters are also at play. Those are real chemicals that really float around in your body. And they really can cross the placenta and affect the developing child. And what happens is that the child’s own stress management system can be expressed in such a way that’s it’s just always off kilter for the life of the offspring. So those kids are more likely to be anxious, they’re less resilient to stress and trauma, they’re more likely to have ongoing mental health issues themselves. Having said that, it’s certainly not a one-to-one correlation. There are a lot of other things that play into it. So that’s actually why we think that untreated anxiety and depression leads to preterm delivery as well because cortisol is also the hormone that kicks off labor, so if it’s dysregulated, then it can lead to this signalling that it’s time to give birth a little too early. And then there are studies that have followed children out to age 18 that look at antenatal depression [occurring before birth]. I think those are really hard to do. Because if the mothers — we always talk about mothers, fathers of course are involved, but mothers tend to be the primary caregivers — if the mother lacks affect, if the mother isn’t responsive to the emotional needs, if the mother is neglectful, if the mother’s not motivated to sign the child up for Head Start because she’s depressed, then that’s going to, of course, affect the child. Q: How does eConsult work, and how does your pilot factor into the bigger system? A: Basically, it’s a fancy, HIPAA-compliant, email exchange. When the practitioner logs on, they have to put in some patient information and ask their question, then submit it. And then I get an email in my inbox because I’m what’s called the “specialty reviewer.” I read it and I can either answer it, or if I have questions, I go back. I can also refer them to a specialist. Q: So, they can’t really tap your expertise until the next appointment? A: So, what advocates have wanted is a perinatal psychiatry phone line where the doctor can call someone who is trained, who can advise from the other end of the line. Massachusetts has a program like that called MCPAP for Moms [Massachusetts Child Psychiatry Access Program for Moms]. Of course that would be ideal. But if we can’t have the gold standard, let’s use what we have and try to at least see if using it works. If it does, great. If it doesn’t, then that actually adds fuel to the argument that we do need some kind of phone line. Q: Why is maternal mental health such a challenging problem to tackle, especially in safety net systems? You have the biological issues and the emotional and the psychological issues and then on top of that you have these systems issues, where in general — in both the public and private sectors — women with serious mental illness get bounced around like a hot potato between mental health care providers and prenatal care providers. The women in the safety net systems are usually so ill that the self-advocacy piece becomes almost impossible. So, we’re trying to bridge that gap to try to capture these women where they are. We don’t know if it will work. But, we hope it will. Q: So right now, as a pregnant person, how would I find a reproductive psychiatrist? A: You could call Postpartum Support International. You would ask your OB-GYN. It’s all word of mouth at this point. It’s hard enough if you have a laptop and an internet connection. Also, you may not even know a reproductive psychiatrist is what you need. Thank you for this article. As a Postpartum Doula, what would be the best recommendation I could give a mother that needs support in this area? Hi Jeri. If your clients are in Los Angeles, they could check out the Maternal Mental Health NOW directory: http://directory.maternalmentalhealthnow.org/. If they are not in Los Angeles, check out Postpartum Support International Resources: http://www.postpartum.net/. Postpartum Support International also has a closed Facebook group of over 7,000 members, which your clients could check out. And finally, Psychology Today has a find a therapist feature that could help: https://www.psychologytoday.com/us/therapists. Hope these help! Yes, these are great! I serve on the board of Postpartum Support International (PSI), it is a great organization.